The productivity gap between firms in developed and developing countries is large. Recent research has focused on both the obstacles and opportunities in bridging this gap. This blog presents new findings, presented in five graphs, from up-and-coming economists exploring firm productivity in developing countries. Evidence shows firms are much less productive in developing economies than in advanced economies. According to 2014 data, productivity (as measured by total factor productivity) in the US was 1.7 times larger than in Mexico, and 2.6 times larger than in India (Feenstra et al. 2015). 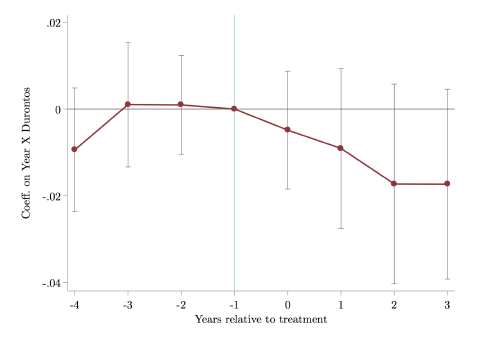 So what prevents firms in developing countries from being more productive? The obstacles range from weak institutions, to lack of infrastructure, to limited access to finance, to bad management practices. Additionally, evidence suggests growth in developing countries may be constrained by the misallocation of resources from less productive to more productive firms. Technology, infrastructure, and international supply chains were all on the agenda as means to increase the productivity of firms in developing countries from Bangladesh to Mexico during the annual IGC-Stanford Conference on Firms, Trade and Development, which took place at Stanford University on 6 December 2018. Finding: The strength of productivity spillovers in Bangladeshi garment factories is greatly affected by the physical distance between production lines. When a sewing line begins to produce a new garment style, the line’s productivity drops by a third on average on the first day (solid squares in graph). Line productivity only returns to its previous levels on the fourth production day. 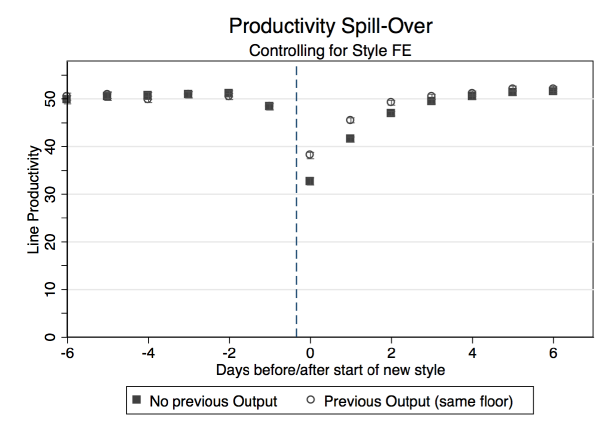 However, when a sewing line is located on the same floor as another line that has previously produced the same style – the initial drop in productivity is reduced by almost 40%, and productivity remains higher for the first three production days (empty circles in graph). Figure 1: Sewing line productivity before and after the start of a new style. 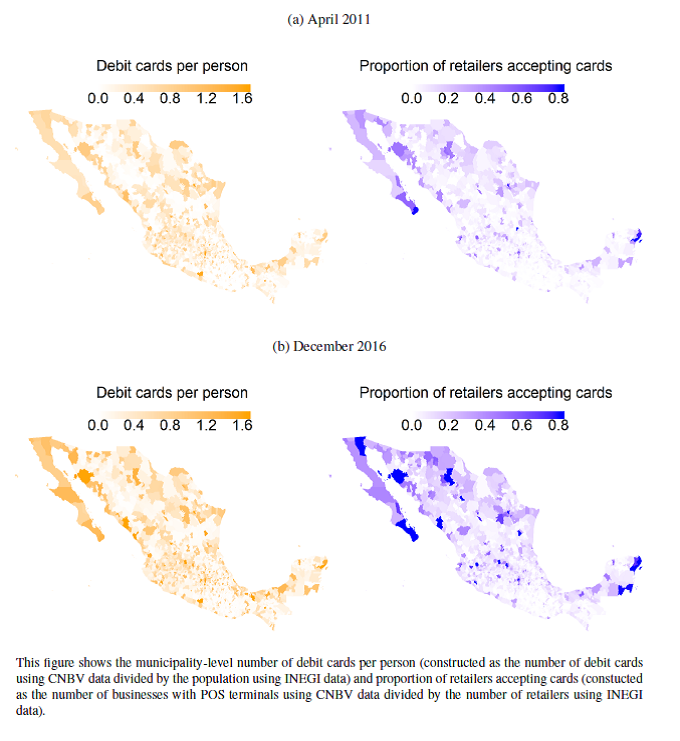 Finding: A ‘shock’ to debit card adoption in Mexico has significant spillover effects for both small retailers and consumers. The Mexican government’s disbursement of one million debit cards to beneficiaries of its conditional cash transfer programme, Prospera, in 2009-2012 led small retailers to adopt point-of-sale (POS) terminals for card payment processing and increased the number of other consumers with debit cards by 21%. Additionally, richer consumers increased their trips to corner stores substituting 12% of their supermarket consumption in response to corner stores adopting POS terminals. Finding: In rural Nicaraguan villages affected by seasonal flooding, the construction of footbridges significantly increases access to labour markets, farm profits, and farm investment. Floods decrease labour market income by 18% in villages where there is no bridge – a bridge eliminates this risk. In villages with bridges, spending on agricultural inputs (fertiliser and pesticide) increases by 45% and farm profit by 76%. Although bridges cost $40,000-50,000 each to build, they appear to be cost effective, with the internal rate of return of bridge construction being 19%. Two-thirds of this rate comes from increased labour income and one-third from farm profit. Finding: Increased congestion on Indian railways from new passenger trains negatively impacts firms using railways to ship goods thereby lowering productivity, and reducing revenue substantially. The introduction of India’s Duronto passenger trains increases railway congestion, making firms’ shipping times slower and less predictable. One two-way Duronto route running through a district leads to a 1.9% decrease in revenue, 1.1% reduction in productivity, and a 0.8% increase in average cost for factories in those districts. Spillover effects are also found: taking an alternate route through a district decreases firm revenue by 1.1% and increases average cost by 0.7%. Finding: Domestic firms that start supplying multinational corporations (MNCs) experience strong and long-lasting gains in firm performance. Analysis of administrative data tracking all firm-to-firm transactions in Costa Rica shows first-time suppliers to MNCs experience strong and persistent improvements in firm performance. For instance, four years after they start supplying an MNC, these firms hire 26% more workers, attain 9% higher profits per worker, and exhibit gains of 6-9% in proxies of productivity. Their business with other buyers improves as well, in terms of both average sales and number of buyers. Survey evidence suggests that becoming suppliers to MNCs is transformative for domestic firms, with changes ranging from new managerial practices to better reputation. 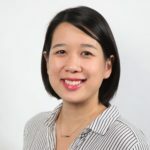 These changes arise from interactions during which MNCs communicate their expectations and advice on how to meet them, and the efforts of new suppliers to rise up to the challenge. Figure 5: Four years after becoming suppliers to MNCs, domestic firms have 9% higher productivity than in the year before their first MNC deal. Source: Alfaro-Ureña et al. 2018. Note: In this graph, productivity is proxied by an OLS production function estimation assuming a Cobb-Douglas production function. Event year 0 is the year when a given domestic firm first supplied an MNC in Costa Rica. 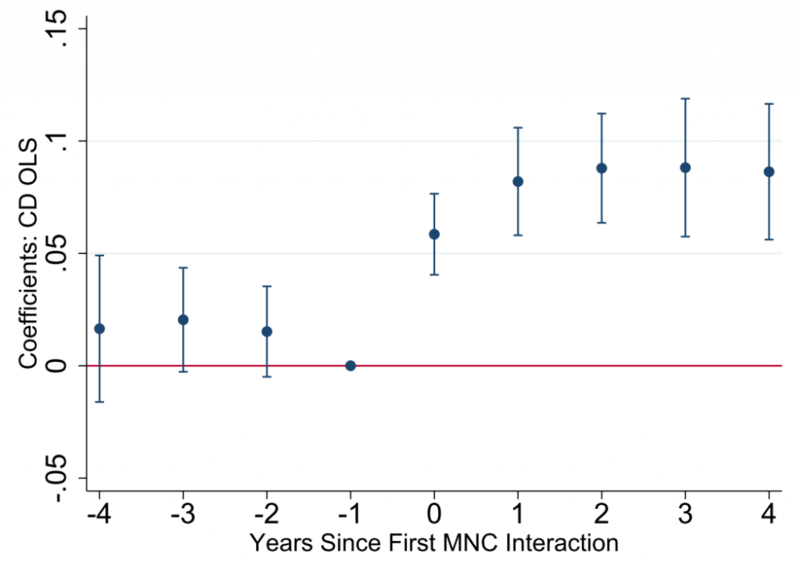 Alfaro-Urena, A, I Manelici, J Vasquez (2018), The effects of joining multinational supply chains: New evidence from firm-to-firm linkages. Working paper. Brooks, W and K Donovan (2017), Eliminating uncertainty in market access: The Impact of new bridges in rural Nicaragua. Working paper. Feenstra, R, R Inklaar and M Timmer (2015), “The next generation of the Penn World Table”. American Economic Review, 105(10), 3150-3182, available for download at www.ggdc.net/pwt. Firth, J (2017), I’ve been waiting on the railroad: The effects of congestion on firm production, Job Market Paper. Higgins, S (2018), Financial technology adoption. Job Market Paper. Menzel, A (2017), Knowledge exchange and productivity spill-overs in Bangladeshi Garment Factories, CERGE-EI Working Paper Series 607.